Note: The source code for this tutorial is available in the tutorials/TutorialGame_Introduction/part6.ras (in the TRSE framework), together with all resources mentioned in these texts. 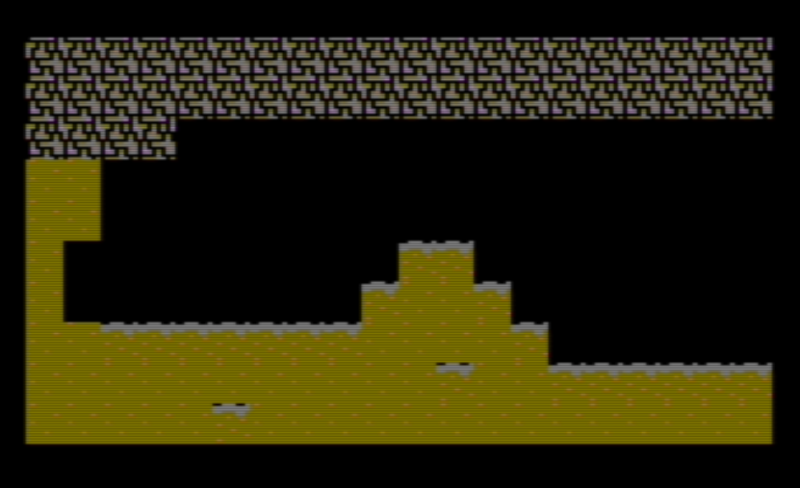 We now assume that you have a character set, a nicely designed level and some rough knowledge on how Turbo Rascal & the c64 works. Now it is time to combine all these things together, and create a level renderer. In order to to things properly, let’s set up a Raster IRQ loop. If you don’t know how this works, be sure to read the general-structure-tutorial and check out tutorial 13. First, create a new ras file (like “part6.ras”). Let’s start with defining the variables that we will use. Note that we’ve used some global defines for the charset and level memory positions, as these will be reference later in the code. curLevel_x and curLevel_y references the current screen level to render. We’ll be using three pointers here: one to reference the color location of the charset (colors, at $2800), a pointer that will point to the level data (levelpointer) and a temporary pointer that will be pointing to color ram ($D800, colormemory). The initialization process should be identical the one in part 4. A quick reminder: the two multicolors + the background colors will be defined by the level editor, while the last (free) color is the one you used to draw the char in the char editor. This color was exported with the binary charset, and will reside at $2800. These are the values that ultimately will be written to $D800. If you’re not looking to understand how the simple level renderer works in detail, we’ll first cover the easy version. You should now be able to move around your levels with the joystick! This procedure contains a bunch of variable declarations that reflect the same level parameters defined in part 5 (level width, data chunk size etc). These are here just read once. The header has a total size of 13 + 32 bytes. To do : write more details about the level renderer.